Painter, etcher and draughtsman, member of a Dutch family of artists. The family was founded by Hendrick Lambertsz. Roghman (d. after 1647), an engraver who married Maria Savery, daughter of the painter and draughtsman Jacob Savery. The Roghmans ran a workshop with their six children, three of whom became established artists: Geertruydt, Roelandt and Magdalena. Roelandt Roghman is usually considered a pupil of Rembrandt in Amsterdam, but there is no documentary evidence, and his style gives little support for this. Houbraken also mentioned that Roghman was blind in one eye. What is certain is that Roghman was familiar with the work of his great-uncle Roelandt Savery and that he travelled a great deal in the Netherlands and probably also through the Alps. A series of etchings of eight Mountainous Tyrolean Landscapes was published in Augsburg; given their realistic character, it is likely that they were executed after his travels. 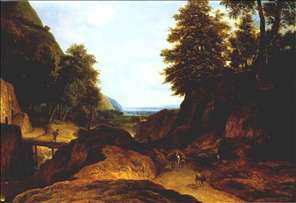 His subjects were mainly forest scenes and mountain landscapes. It is possible but unconfirmable that Roghman also visited Italy, but he is documented in Amsterdam again in 1658. 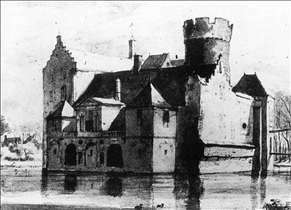 See more details about "Loenersloot Castle"
See more details about "Valley with Travellers"